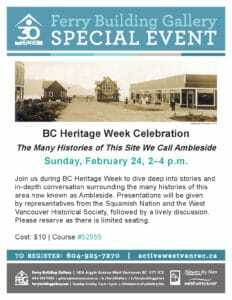 Sunday, Feb 24, 2–4 p.m.
Join us during BC Heritage Week to dive deep into stories and in-depth conversation surrounding the many histories of the area now known as Ambleside. Presentations will be given by representatives from the Squamish Nation and the West Vancouver Historical Society, followed by a lively discussion. Please reserve as there is limited seating. Register at 604-925-7270 (course #52555) or online.